A recent standout in my Angel Trumpet jungle was this bloom on a seedling from a cross I made between Brugmansia Axelrose x Marbach. The bloom color is a vibrant orange with a creamy yellow throat. The corolla teeth do not recurve and the blooms are medium in size.We are still experiencing summer like weather here in Central Florida and the blooms are holding up great in the heat.I like the looks of this seedling and plan to put it in my watch zone. I was out of town on business for over a week and when I returned I found out my shade house had been invaded by caterpillars. 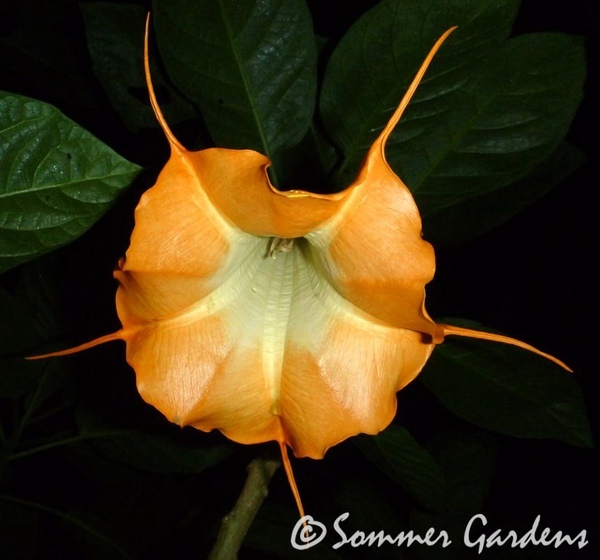 Their feeding frenzy quickly gave many of my Brugmansia the Swiss cheese look.